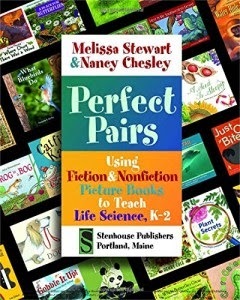 Educator, Nancy Chesley, and nonfiction author, Melissa Stewart, have teamed up to create Perfect Pairs, a professional resource for K-2 teachers. The book includes 22 life science lesson plans organized by grade and concept. Each lesson is inquiry-based and begins with an "I wonder" statement for students to think about and respond to in their science journals. The lessons are structured around a three-step "Investigative Process." 3) Encouraging students to draw conclusions. Fiction and nonfiction picture books are paired in each lesson to help young students grasp specific science concepts. For example, the lesson about how animals protect themselves pairs Swimmy by Leo Lionni with What Do When Something Wants to Eat You? by Steve Jenkins. The picture books selected by Stewart and Chesley could also serve as mentor texts for young writers. Perfect Pairs provides teachers with meaningful ways to use literature and inquiry to engage students in life science concepts. This is a resource that primary teachers should have on their shelves. The "Bibliography of Picture Books" located in the back of the book will be helpful to librarians and teachers looking to beef up their science collections. Librarians, order Perfect Pairs for your library's professional resource collection. The teachers in your school or community will thank you! The table-building activity in the Exploring with Students section is also a great way to model how to extract critical information from a text. This same skill will be used as students start to take notes while doing research for reports.